On a hot, sunny, humid afternoon in early June, a Wood Stork stood in a wide expanse of marsh grass and mudflats on the edge of a pond, its bare, mud-gray head and long down-curving bill looking prehistoric and strange. Great Egrets – tall, sinuous, long-necked and white – stalked in the water nearby. A Snowy Egret, a Tricolored Heron, two Glossy Ibis – the longer we looked, the more emerged from the background. Two Least Terns fluttered over the pond, flashing silvery white, hovering, pausing, diving in crisp, quick bursts. The Wood Stork had just flown in and settled in the grass. Watching it, I became aware of high, agitated calls that sounded like breek! breek! and saw one or two smaller birds darting up again and again close to the Wood Stork. Looking closer, I saw with amazement a slender black and white bird with impossibly long, thin red legs – a Black-necked Stilt. It was a life bird for me. I had never seen a Black-necked Stilt before anywhere, and had not known they might be here on Kiawah. A pair were flying up again and again around the Wood Stork and calling in alarm. Finally, after five or ten minutes, the stork spread its wings heavily and drifted to a different spot, out of the grass, in an area of open shallow water. After seeing those first two Black-necked Stilts, we began to see others spread out all through the marsh grass around the pond. They flew up here and there briefly, sometimes flew from place to place, low over the edge of the water, and several stalked out into open areas of mudflat and shallow water, where we were able to see them very well – their slim, elegant shape, long thin black bill, sharp black-and-white pattern, neat round head – and the erect, precise way they moved on the long, thin red legs for which they are named. 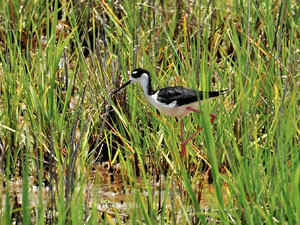 The Stilts were the birding highlight of a week-long visit to Kiawah Island, off the coast of South Carolina, this year. It was a family gathering – not a birding trip – but everyone was pretty patient with me because I had to work in a little birding, and couldn’t help but come in again and again, exclaiming over Black-necked Stilts! Or Wood Storks! Or Gull-billed Tern! And I wasn’t the only one. It’s hard to be on Kiawah and not notice the birds – on the beach, in the marshes, over the lagoons and even soaring over the golf courses. You never know what you might see. Several of our family saw Black Skimmers sweeping low over the edge of the waves on the beach, something I missed on this trip. One of my most interesting sightings along the beach was not a shore bird, but a Sharp-shinned Hawk that flew rather high over the edge of the surf in early twilight one evening, as we walked around the tidal pools and waves while the tide was going out. That evening and others when we were out, I especially enjoyed hearing the song of a Chuck-will’s-widow, too – not along the beach, but close to the house, where open marsh areas and a lagoon were not far away. We biked several times to the Willet Pond and Ibis Pond, not far behind the dunes on the eastern end of the beach. The ponds and the marsh and mudflats around them turned out to be very active spots, and Clate got some amazing photos there. His photos capture what we saw much better than my words can. We had a rare chance to watch four Wood Storks at very close range, foraging with other wading birds, and also soaring – when they fly they are transformed, from plodding, awkward, slow-moving shapes into sleek white outstretched wings, edged in sable, that sail as if they were made of air. In the ponds and marshes Red-winged Blackbirds sang and flashed the colors in their wings. Two Green Herons stalked in the grass and shrubs near the edge of the water. Lots of Laughing Gulls flew over and all around us, perched on the rail of an observation deck, and dove down to fish, and three or four Royal Terns flew by. Snowy Egrets, with their bright yellow “golden slippers” foraged in the shallow water with Little Blue Herons and Tricolored Herons in blue-gray and white, with a thin ribbon of orange down the throat. One morning an Orchard Oriole – with handsome chestnut-red body and black hood – perched in the top of a shrub and whistled a clear, musical song. Two Glossy Ibis foraged on the far edge of the Willet Pond, too far away to see their dark blue-green and rust-colored plumage well, though their shapes and long down-curved bills were distinctive. Twice I saw a fairly large, rufous-orange bird fly up out of the grass and back down again, so warmly colored I think it must have been a King Rail. We also saw a beautiful Gull-billed Tern flying over the Ibis Pond. I’m not familiar enough with terns to be completely sure of the identification, but its size, coloring and rather heavy, all-black bill were distinctive – so I’m fairly certain it could have been nothing else. I also saw them flying over the waves along the beach. Meanwhile, across the road from the Willet Pond, two Ospreys were active around a large nest in a pine that was occupied by a Great Horned Owl in mid-March. They soared, circled, perched in pines very near the nest, and several times brought fish to nearby pines to eat. Twice one of the Ospreys flew to the nest and sat in it for a few moments, then left it. On the last day we were there, we saw one of the Ospreys fly to the nest with a stick and appear to be working it in. After we returned home, I found an April 18 report from the nature program on Kiawah Island that “the last owlet at Willet pond is now gone and the Ospreys have moved in, they were spotted re-building the nest and courting. (Kiawah Island Golf Resort) So I’m not sure what was happening now, two months after that report – but it seems like they have reclaimed the nest even after it was used by the Great Horned Owls. Thank you again, Janet, Bruce, Rebecca and Maggie for sharing your home with us all! And thank you Dylan, Bea, Carter and Gillie, Darby, Jenny and Tallulah, and great-grandparents Robert and Mary Lee for being there, too. We celebrated Gramps’ 90th birthday and Tallulah’s fifth birthday, so it was a special time, a week to remember. We’re very lucky to have such a beautiful place to gather – and to share with the birds and other wildlife of Kiawah.